Belonging is a fraught concept – a seemingly human need for connection and grounding, it is laden with connotations of home, family, privilege, and exclusion. It is often used either in the negative, longingly, denoting absence (as in lack of belonging) by exiles, outcasts, and transients, or, if positive, as a justification for building walls against or otherwise exiling those who disturb the homogeneity of that space to which the settled imagine they belong. The question of who belongs, who claims space as home, and who has to fight for belonging, is in many ways at the center of contested Australian identity, as it is in many other nation states around the world today. It is asked when Australians deal with their history as a penal colony, moving from a legacy of shamefulness to reclaiming the convict past, which can now be retraced with the help of government archives and search engines. Since the 1970s, it has become commonplace to acknowledge the inhumane forced displacement to faraway places of sometimes petty criminals, who were then used as free labor to build the new, modern cities of the vast new colony. The question of who belongs is, of course, invoked in the postcolonial acknowledgement that the Australian land was forcibly and brutally taken from First Nations peoples, many of whom were killed or kidnapped for the sake of the great civilizing and expansionist project undertaken by the British Empire. That legacy is, perhaps, the hardest to reckon with as we visit the amazing city of the cosmopolitan, maritime, wealthy, and fun-loving Sydney. And, thankfully, it has been raised in a number of different contexts, by artists in particular, sometimes provocatively, as in the production of Blackie Blackie Brown, which we were lucky to be able to see on Wednesday night (see Jimmy’s blog post). 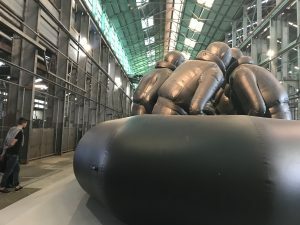 Lack of belonging also stood at the center of the amazing piece “Law of the Journey,” by Ai Weiwei, which has been installed on Cockatoo Island, together with art works by 9 other artists, as part of the Sydney Biennale. The ferry ride there offered wonderful views of Sydney Harbor, of the iconic Harbor Bridge and the Opera House. The island itself is named after birds that have left the island in the early 20th century , mainly because the newly erected industrial structures that were used as an overflow prison for convicts, a girl’s industrial school, a reformatory, and a shipbuilding and repair yard robbed them of their habitat. 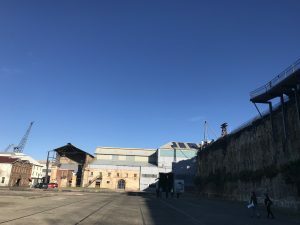 The large industrial halls, now mostly defunct, made a perfect space for artwork like Weiwei’s that explore the impact of the “human crisis”, as Ai calls it, of the recent, large scale migration of refugees across the Mediterranean. 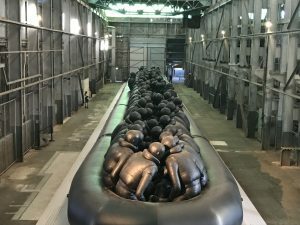 Law of the Journey is monumental in scale, about 60 meters long, an oversized lifeboat with many people sitting huddled and crammed around the perimeter of the boat, as well as crouching in the middle. Susan remarked that the different postures held by the anonymous figures had a humanizing effect, making them seem more like individuals, even despite their anonymity. We could climb on a metal bridge to view the installation from higher up, and were also able to walk around the whole boat, which allowed for views from below at these humans on their unfathomable journey, having been forced to leave familiar, but unsafe places, and venturing into the unknown, towards safer, more privileged places in Europe whose affluence resembles that of this Australian city. And reared each frontier walk. And earth was made for all.